Starbucks plans to open its franchise stores in the southern regions of Russia and join local restaurants in serving guests at the upcoming Winter Games in Sochi. Starbucks will open coffeehouses in Sochi, Rostov-on-Don and Krasnodar in the next 12 months, according to the company’s spokesperson. “The southern regions of Russia are developing dynamically, showing a high level of demand for quality coffee,” says Mojtaba Akbari, general director of Starbucks' Russian management company, Kofe Sirena. The number of coffeehouses that may be opened in the southern cities and the amount of investment to be put into them has not yet been disclosed. The cost of opening Starbucks cafés is standard — about $2,000–2,500 per one square mile, according to Andrei Petrakov, executive director of Restcon. Investment for opening one outlet will be approximately $1,400 per one square mile, or about $250,000, without the cost of real estate, notes Mikhail Burmistrov, general director of INFOLine-Analitika. The potential for development is favorable in the southern regions; yet there are plenty of local cafés and restaurants there already, and it will be hard to gain a foothold, believes Elena Mazur, director of corporate communications of Rosinter Restaurants. “Competition with local players can complicate the development, but Starbucks is an international chain with good coffee, which may eventually gain the loyalty of residents in these cities,” says Petrakov. Starbucks came to Russia in 2007, through a joint venture with Kuwait's MH Alshaya. Now, the Russian division of the chain has more than 60 coffeehouses, but only three of them are located in St. Petersburg — all the rest are in Moscow. According to Petrakov, the company is simply trying to test the regional markets. And this makes sense: Development in Moscow has its limits, and leasing rates in the capital city are very high. Bringing the brand to Sochi before the Winter Olympic Games can be seen as an image project, but it is unlikely that this will not pay for itself, it terms of economic efficiency, Mazur emphasizes. 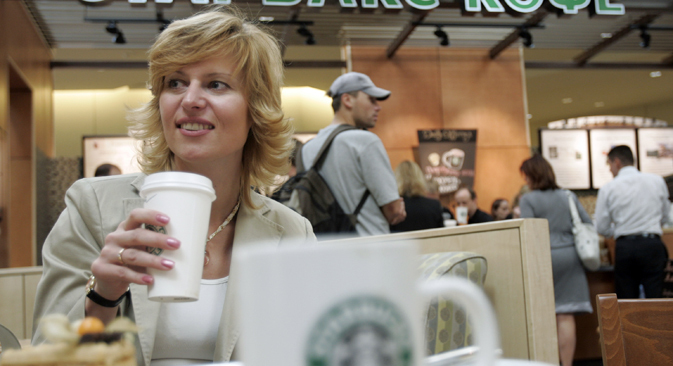 Given the income level of the populations in Sochi, Rostov and Krasnodar, as well as the large number of summer tourists from cities where Starbucks is already popular, Starbucks is virtually guaranteed success, given the correct placement of its coffeehouses, believes Burmistrov. “Large disposable incomes and the specifics of consumer behavior of Sochi inhabitants — who are characterized by their conspicuous consumption and a high level of loyalty to strong brands — leads to the conclusion that Starbucks will be successful, and not only as a project for the Olympics,” says Burmistrov.